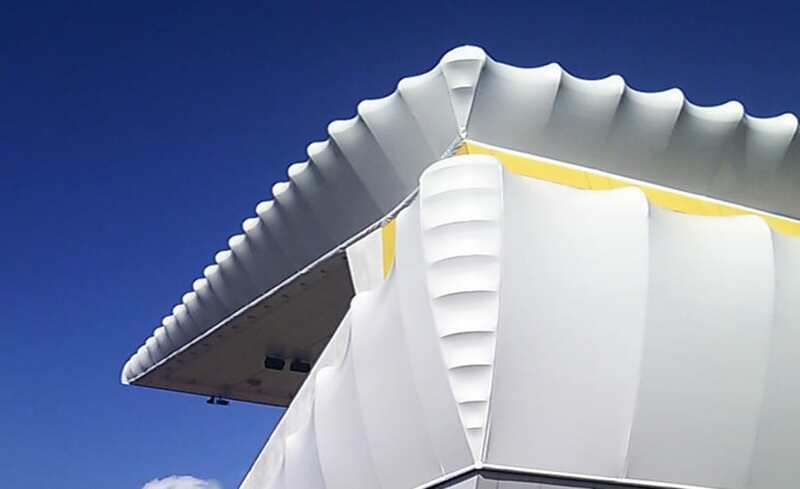 As part of the changes being made to the existing Alexander Stadium in order that they could qualify for the Athletics Diamond League, Architen Landrell was contracted to design, manufacture and install a curved fabric skin for one of the grandstand canopies. 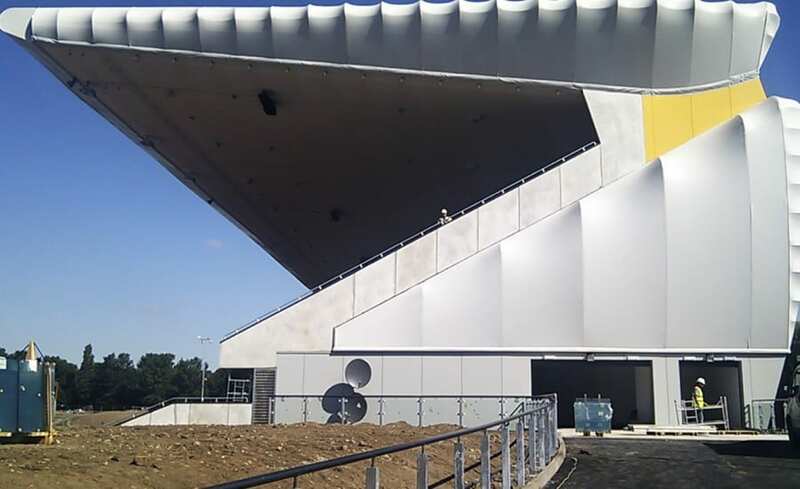 Working alongside main contractor Thomas Vale Construction who was responsible for the main refurbishment works, Architen Landrell’s involvement entailed the design, manufacture and installation of fabric cladding to the rear wall, roof, and side walls and gables of the new purpose built grandstand for the athletics stadium. 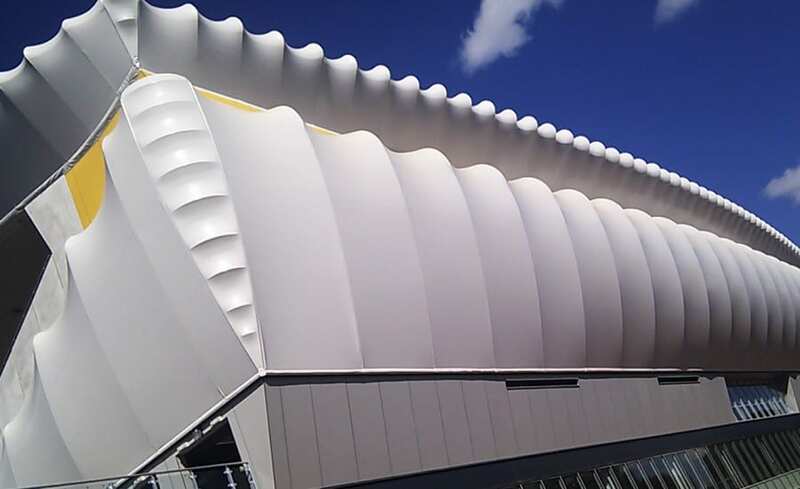 At the request of the architect, S&P Architects, the structure was clad in a light grey PVC coated polyester which creates the curved form whilst still offering a cost effective and easily maintainable solution. 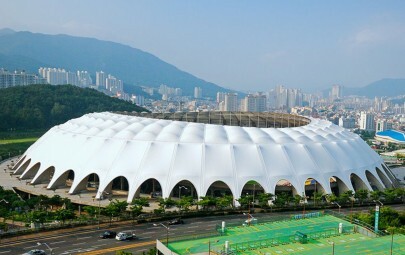 Despite a complex design process, the tensile fabric worked effortlessly to achieve the high radius curves which the scheme required. For manufacture and construction purposes, the rear roof and walls were divided into 4 separate fabric bays which create a graduating curve in plan. The gable walls and roof were then subdivided into 12 panels with a similarly gracious curve meeting the rear elevation and leading to a very graceful scalloping around the perimeter of the structure. Programme was extremely tight so the fabric panels were made in our Chepstow manufacturing space and then transported to site in batches to ensure that our onsite workforce could start installing as early as possible. 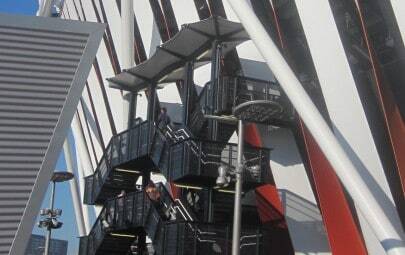 Despite steelwork being supplied by others, we had to work very closely with the steel contractors in order to ensure that the fabric and steel matched each other seamlessly. The complex curves and the high undercut of the roof meant that once the steelwork was in place, installation had to be carried out predominantly by cherry picker with some additional rope access – the nature of the over and under hangs separated meant that you couldnt physically get a cherry picker in. 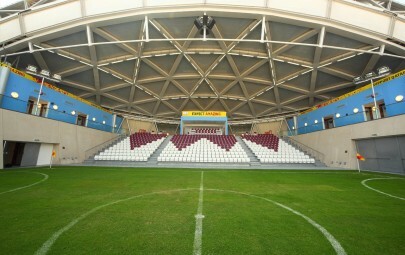 With work complete on time and on budget, and the grandstand looking like the world class venue it is, the stadium was inspected in July 2011 and announced as one of the venues of the Diamond League. The Architen Landrell team is proud to say that they played a part in this achievement and look forward to seeing it on TV!